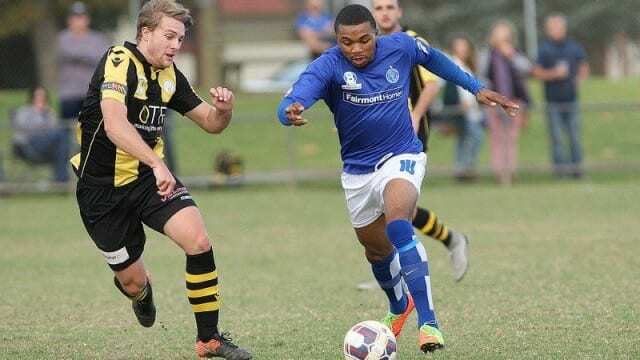 Last Saturday, West Torrens Birkalla finished the first half of the 2017 PlayStation 4 National Premier League SA with a 2-2 draw against Adelaide Blue Eagles. The game almost appeared to be going to the visitors, when a late goal from Lawrence D’Arrigo ensured a draw at the end of play. Although relieved to share the points at full time, Coach Steve De Giovanniello found the result disappointing. “We could have very easily lost, thankfully Lozza scored in injury time. I still went away very disappointed because of the second half though. “In the first half at 1-all we really dominated and created chances, we just weren’t clinical enough and didn’t score from the chances. When asked if Saturday’s draw could be looked as a step-back from recent in-form results, De Giovanniello said it could go both ways. “There are two ways you could look at it. We showed real character to come back, but, I would like to see that type of urgency for 90 minutes, not just when we are losing. “The same thing happened against Adelaide Comets. We went 2-1 down against them and then we dominated in response. Round 12 brings MetroStars to Jack Smith Park. The side, who currently sit in 3rd position on the League ladder, doesn’t intimidate De Giovanniello. “We are at home and we are always confident at home. We didn’t play bad at all on Saturday, I think we are still playing good football and we have got a good balance,” he said. Be there to support the Seniors, Reserves and Under 18’s this Saturday the 27th of May at Jack Smith Park!